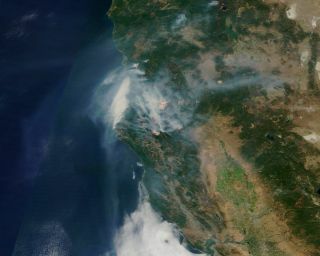 Smoke from the wildfires blazing in the western United States covers much of northern California and Washington state in new images taken from space. More than 160 wildfires are currently burning in the American West, according to InciWeb, a government information management system. The wildfires have forced evacuations in Oregon, California and Idaho, according to Reuters and other news sources. In California, more than 100 wildfires have been reported in the dry conditions, NBCNews.com reported, but satellite photos released by NASA captured imagery from the five largest ones. Drought conditions in Southern California and overly dry fuels (such as wood and grass) in the Northwest will lead to elevated fire risk for much of August, according to the National Interagency Fire Center (NIFC). Conditions are monitored using satellites from NASA, the National Oceanic and Atmospheric Administration (NOAA) and occasional observations from astronauts aboard the International Space Station. Scientists have tried to use space-based technology to create wildfire warning systems. In central Washington, the NIFC asked 200 active-duty military troops to help fight about 95 wildfires, the Associated Press said this morning (Aug. 19). Statewide, the fires have destroyed about 170 square miles (440 square kilometers) and 75 buildings. Officials are allowing some wildfires to burn in the northern Rockies because many of the limited resources are being used near towns and cities in Washington and Oregon, the AP added. Roughly 30 percent of the fires near the resort town of Chelan, Washington, are contained, according to the AP. According to NOAA, critical conditions for a wildfire occur with sustained winds of 20 mph (32 km/h) or greater, minimum humidity and temperatures above 50 to 60 degrees Fahrenheit (10 to 15.5 degrees Celsius) for at least 3 hours. The Terra satellite captured this image over western and central Washington state on Aug. 17, 2015. Five major fires are burning in the north central part of the state. In addition, the Tower Fire in the northeastern corner of the state and the Cougar Creek Wildfire in the southwestern part of the state are adding to the smoke. The red pixels are heat signatures detected by the Moderate Resolution Imaging Spectroradiometer (MODIS) instrument onboard NASA's Aqua satellite. The fire forecast also depends on the availability of dry fuels. Moisture in wood and other wildfire-spreading materials can change rapidly depending on the weather conditions, NOAA added. The Terra satellite launched in 1998, and a recent study using data from the satellite showed that smoke from agricultural fires in North Africa causes a reduction in regional rainfall. The fires are used to increase agricultural productivity and clear land for farming. Looking down on Earth, the Terra satellite has also captured stunning images of hurricanes, volcanoes and other features of the planet.